One of the realities of rural life in Nepal children in the house not just running errands and chores in and around the house, but also engaging in income generating activities to contribute directly to the financial situation of the home. Obviously, that negatively affects their education. Navraj helps out the family a great deal. In spite of that, he manages to devote time to and is dedicated to his studies so much that he is recognized as the best student in the school. 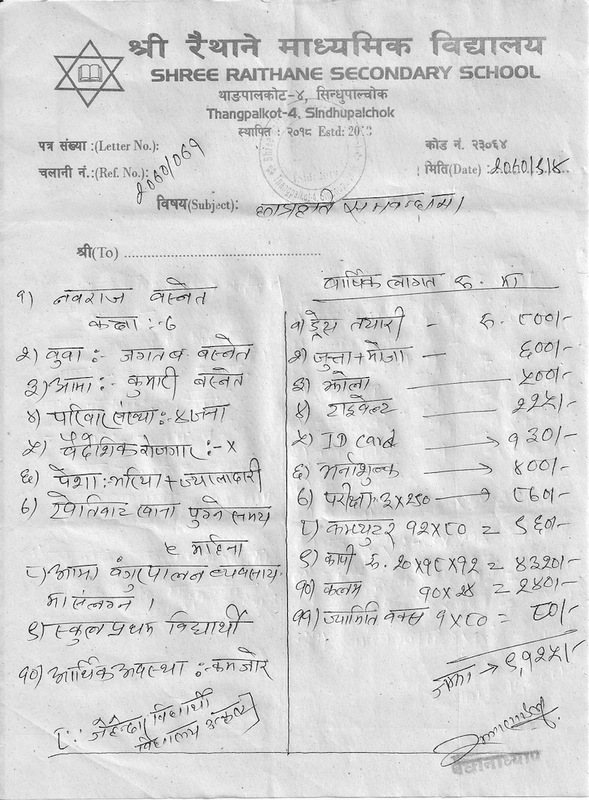 Attached below are details of his family and the cost of his education. At the current rate of exchange of approximately Rs. 98=US$1.00, the total cost amounts to US$93/year as a 7th grader. However, he has just four more months in 7th grade. Academic year in Nepal runs from mid-April to the beginning of April the following year. That means, he’ll need support for at least the next 3 years. 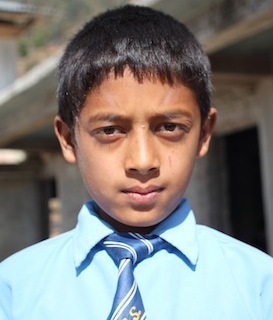 Purchases by Nemira Customers 1 – 6 has ensured that Navraj gets to finish school! Navaraj passed his exams and has moved on to grade 8! Details of his educational costs for the 2014-15 (2071) academic year can be found here. Navaraj passed his exams last year at the top of his class again and currently in grade 9. Details of his educational costs for this academic year can be found here. His family house was one of the 594 houses in Thangpalkot destroyed by the earthquake of April 25. While no one in his family suffered any injuries or casualties, one of the three goats they owned was killed. It’s been almost two years since the last update, and I have some excellent news to share about Navaraj. He did very very well both in 9th and 10th grade end-of-year examinations. Following that, he sat for the national level School Education Examination (SEE)– high school diploma examination essentially–which he passed with the highest average possible–A+. In the few conversations I have had with him, he has expressed an interest in studying medicine and becoming a doctor. The next stage in his academic career is, what in Nepal is called Higher Secondary School (HSS), tw0 years before going on to College for undergraduate studies or for a professional qualification, such as medical studies. And I have great news to share on that front. Shikshya Foundation has agreed to fund his HSS education at a private residential institution in Kathmandu. COMMITTED will be contributing a small amount to his educational costs and will be keenly following his progress in the years to come.